Anyone under the age of 21 will quickly point out that 35 is old (like, really old). The Toyota Camry has been around 35 years, and that is a long time – but the Toyota Camry is anything but old. Every generation of Toyota’s midsize sedan has built upon the last to create the state-of-the-art car you find today. The all-new 2018 Toyota Camry is stylish and sophisticated – your teenager might even say it’s “lit”. The Toyota Camry has been completely redesigned for 2018. The leader of the midsize sedan segment must look the part – and the 2018 Toyota Camry indeed does. Sweeping curves and chiseled surfaces define the Camry’s profile. An aggressive front grille heralds the Camry’s arrival, and an integrated rear spoiler announces its departure. There’s also LED lighting front and rear. Step into the Toyota Camry, and you’ll find a cabin finished with high-quality materials. A large touchscreen infotainment display is the centerpiece of the cockpit. The interior is roomy and luxurious, with plenty of space for 5 passengers and their cargo. 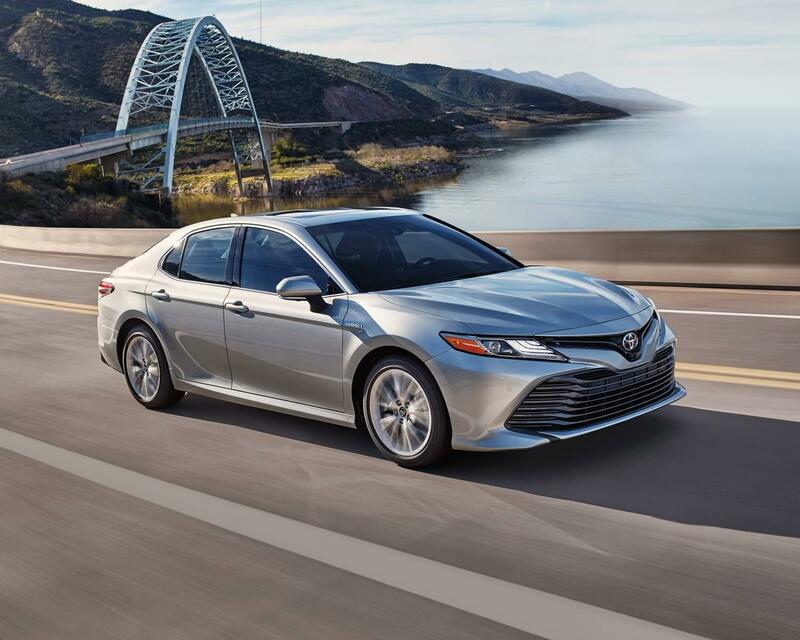 The Toyota Camry is available in five trim levels: L, LE, SE, XSE and XLE. A wide array of standard equipment is found on the Toyota Camry. The list includes automatic LED headlights, a rearview camera, keyless entry and a touchscreen infotainment system. Also, all Camry models come equipped with Toyota’s Safety Sense. This suite of technologies includes adaptive cruise control, a pre-collision warning system, lane departure alert with steering assistance, and automatic high beams. Panoramic moonroof: This isn’t your run-of-the-mill sunroof. The Panoramic moonroof found in the Toyota Camry features a tilt-slide function. This allows double the light of a traditional moonroof to enter the interior. Bird’s Eye View Camera with Parameter Scan: Ever wonder what the top of your car looks like to birds (other than a porta potty)? Now you can get an avian-view of your vehicle to help you park in the tightest of spots. Wi-Fi Connected Power by Verizon: Now your Toyota Camry can be a Wi-Fi hotspot, thanks to Wi-Fi Connected Power by Verizon. Just because you’ve got four-doors, doesn’t mean you can’t have fun. The Toyota Camry offers three powerful and economical engine options. 2.5L four-cylinder: The base engine is a 2.5L producing 203 hp and 184. Fuel mileage is as much as * 29/41 mpg city/highway. 3.5L V6: If you’re looking for even more power, step up to the 3.5L cranking out 301 hp and 267 lb-ft.
2.5L four-cylinder hybrid: For maximum efficiency, the Toyota Camry can be had with an advanced hybrid drivetrain, which combines a 2.5L gasoline engine with an electric motor. Fuel mileage for the hybrid is up to 51/53 mpg city/highway. All Toyota Camry models besides the hybrid come with an 8-speed automatic transmission. Front-wheel drive is found on all Camrys. If you want to experience the all-new 2018 Toyota Camry firsthand, come down to Pedersen Toyota. We have a large lineup of Toyota Camry waiting to be test driven.